This is an addin for Autodesk® Revit® that provides commands for batch renaming elements such as levels and gridlines. The shift command allows you to select the elements that you want to rename and shift the sequence by a given amount. For example, say you have a 100 story tower and you eliminate a few levels. All the levels above will need to be shifted down. It is a time consuming task made quick and simple by this command. The resequence command allows you to rename the selected elements to the format (base name) + (number incremented by 1 for each level). For example, you move around the levels in a 100 story tower, such that the levels are mix up and not in sequence. Or you have a 100 story tower with the levels named Level 1, 2, 3, etc. but you need to rename level 1-8 as Retail Level 1, 2, 3 – 8, level 9-45 as Office Level 1 – 37, and the rest as Hotel Level 1, 2, 3, etc. 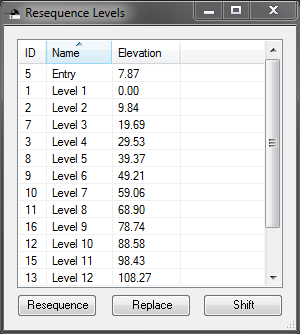 In both of these cases, the resequence tool allows you to quickly rename the levels as needed. The replace command allows you to find and replace all or part of element names. For example, find Level B1, B2 etc. and rename them to Basement 1, Basement 2, etc.